Coyote tracks look similar to dog tracks, and some dog tracks may be nearly identical to coyote tracks. However, coyote tracks typically have a few distinctive characteristics that can help you decipher between a domestic dog and coyote. 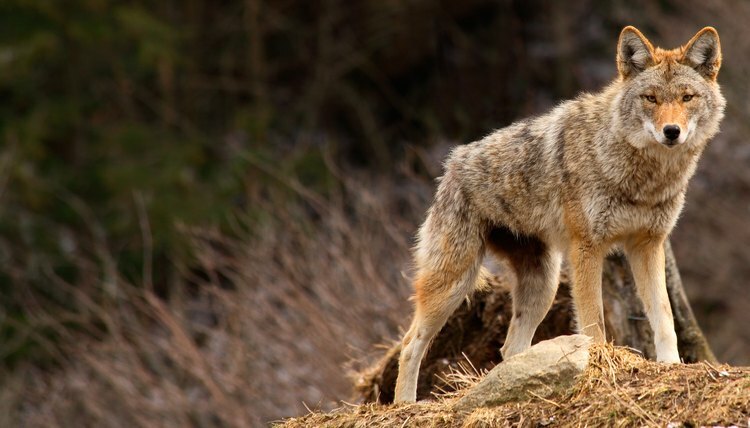 Coyotes are elusive; they tend to stay away from humans; but occasional reports of coyotes preying on pets and livestock are enough to make you want to know when a coyote inhabits your neck of the suburbs. Coyote paw prints tend to be much more oval than dog tracks, meaning they are most often longer than they are wide. A typical dog paw print is rounder. Like dog and cat paws, coyotes have four toes and a heel pad. According to the University of Illinois Extension website, coyotes make slightly larger heel impressions than dogs. The space between the toes and heel pad, called negative space, is much larger in coyotes than in dogs. Domestic dogs come in all shapes and sizes, from the tiny Chihuahua to the massive Great Dane -- meaning the prints of domestic dogs can vary greatly in size. Coyote prints also vary in size, but to a lesser degree. In general, a coyote's front paw print measures approximately 2 1/2 inches long and 2 inches wide; the hind paw print is approximately 2 1/4 inches long and 1 3/4 inches wide. Unlike cats, neither coyotes nor domestic dogs can retract their claws, so claw marks are almost always visible on a print made by a canid in even somewhat soft material. Coyote paw prints typically show only two defined claw marks on the middle toes; dog tracks often show all four. Tracks on a hard surface may not show any claw marks. Coyote claws are sharper than the nails of domestic dogs -- look for the point where the sharp tip of a coyote's nail goes deeper into the ground. Consider the distance between prints and their positioning to determine whether a track is that of a dog or a coyote. In a trot, a coyote's stride is typically 16 to 18 inches, and the hind tracks are in line with or on top of the front tracks. As domestic dogs walk, they tend not to walk in straight lines, making their tracks somewhat off-centered. Coyotes, on the other hand, almost always walk in straight paths, making their tracks more linear and even. Wild felines including bobcats (Lynx rufus) and mountain lions (Puma concolor), have four toes and a heel pad on each paw, like coyotes. One key difference between these tracks and coyote or dog tracks is the lack of claw marks. Also, cats have three lobes on the rears of their heels as opposed to two. Another canine, the red fox (Vulpes vulpes), has paw prints you can distinguish from coyote prints, though they're roughly the same size by the toe size -- each toe makes a larger, wider imprint, and the heel may be slightly smaller than that of a dog or a coyote. fox paw prints are much more spread out, and the toes are larger.